OPPO yesterday confirmed it will soon launch the F11 Pro smartphone in India. The mid-range offering has been leaked incessantly over the past few weeks and the company recently teased it via its official Twitter account. 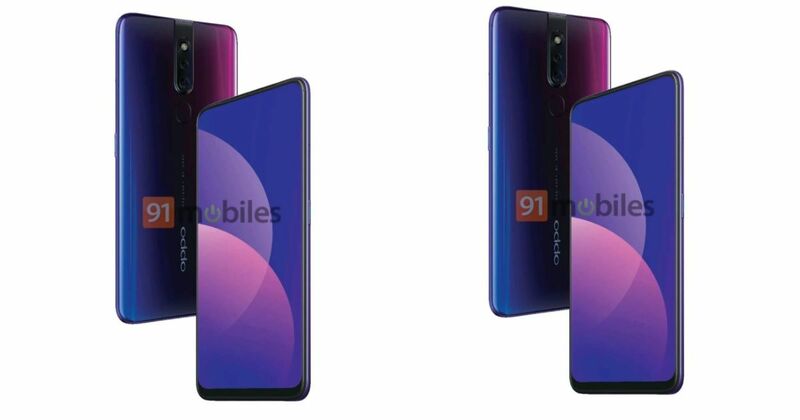 The OPPO F11 Pro India launch date is yet to be revealed, but rumours suggest it could be towards the beginning of March. Ahead of the official unveiling, a live image of OPPO F11 Pro has surfaced to reveal the gradient finish and colour options. Tipster Ishan Agarwal posted the live image of the OPPO F11 Pro and also said that pre-bookings for the handset will begin as early as February 22nd. As seen from the image above, the smartphone will be available in at least two colour options: Blue and Purple. The purple option clearly has a gradient finish, but the same could not be said with certainty about the blue one. Other details such as camera modules seem to be at the exact same position as seen in renders. The phone will arrive with dual cameras placed on the vertical-strip that extends from the top edge of the back panel, and just below that, you get a fingerprint sensor. A separate press render by the same tipster shows the upper half of the back panel. While the fascia of the device has not been revealed, previous leaks have already confirmed an edge-to-edge display with no notch or bezel whatsoever. Moreover, the phone is said to boast of an elevated front camera, which is tipped to be a 32-megapixel shooter. The primary cameras of the phone are confirmed to rock a whopping 48-megapixel sensor paired with a depth sensor (resolution unknown). Under the hood, the OPPO F11 Pro will reportedly pack a MediaTek SoC, paired with 6GB of RAM and 128GB internal storage. The phone will most likely arrive with a price tag of under Rs 25,000. That’s all we know so far, but stay tuned for more details!